This Sweet Whole Seed, also called Chan Pui Mui, is a sweet whole plum flavored with flakes of orange peel. It is the deliciously sweet (with a touch of sour) uncracked version of cracked seeds. Rock Salt Plum uses the same seed, but adds a slightly salty touch to the sweet seed. 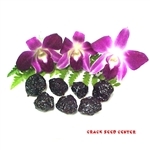 If the seed is too much of a hassle for you, try our Seedless Plum.